The figure of the composer-performer is rarer today than it was in past centuries, and that of the composer-vocalist rarer still. The Polish composer and singer Agata Zubel (b.1978) is one such rarity. Her special talents were recognised when she received the top award at the 60th UNESCO International Composers’ Rostrum in May 2013 for Not I (2010). Zubel’s experience as a performer has undoubtedly had a bearing on her understanding of vocal production and of the relationship between voice and ensemble. Her repertoire is broad, ranging from Caccini and Vivaldi to works by Berg, Copland, Krenek, Nono (Il canto sospeso), Schnittke, Schoenberg (Pierrot lunaire) and Sciarrino and on to the music of contemporary Polish composers. A significant part of Zubel’s performing schedule is devoted to ElettroVoce Duo, which she formed in 2001 with the composer, pianist and computer expert Cezary Duchnowski. She has a unique connection to the music of Witold Lutoslawski. On the one hand, she sings his Ravelian Chantefleurs et Chantefables ‘straight’, as it were, while on the other she radically reinterprets his pseudonymous ‘Derwid’ songs – fox-trots, tangos and waltzes – in a stunning display of vocal agility, satirical insight and cabaret humour. Zubel knew from a very early age that she would be a composer. Her musical activity as a child and teenager was primarily as a percussionist and it was only after performing one of her first compositions – Parlando for voice and computer (2000), which she had written for the American singer Christina Ascher, who was visiting Zubel’s home city, Wroclaw – that she began to be in demand from other young Polish composers to sing their works. For Zubel, all her musical activities interact and are indivisible, and this unity of purpose and her sense of the total ensemble is evident in her compositions. She is one of the most charismatic composers of her generation, her music characterised by freshness, clarity of purpose and a keen sense of both the interior and the exterior drama of life. Labyrinth, scored for voice, bass flute, trumpet, tenor saxophone (or bass clarinet) and double-bass, is a setting of an English translation of a poem by the Polish poet, and winner of the 1996 Nobel prize for literature, Wisława Szymborska (1923-2012). It was commissioned by the Polish Institute in Tel Aviv and premiered in Jerusalem, during a ‘Polish Connection’ concert on 14 May 2012, by the composer with the Meitar Ensemble conducted by Guy Feder. It was not the first time, nor the last, that Zubel turned to Szymborska’s work. One of her student compositions – Birthday for a cappella chorus (1998) – was a setting of a Szymborska poem, and ElettroVoce’s current repertoire includes Szymborskian Improvisations for voice, piano and computer. In Labyrinth, Zubel captures Szymborska’s breathless evocation of the anxiety of making choices (the poem is a sequence of 63 quick-fire lines). One of Zubel’s characteristic gestures is the sublimation of the voice in the instrumental texture, usually in rhythmic unison with one instrument or more. In the brief, frantic opening of Labyrinth, this pattering texture is relatively heterophonic, although the voice is partnered by the tenor sax. The music then almost disappears into delicate suggestiveness – another feature of Zubel’s music, the instruments evoking a sense of mystery with breathy fragments and sustained, barely audible glissandi. When the voice joins in (partnered this time by the double-bass), its broken, half-whispered text is initially delivered through a megaphone. The full ensemble re-emerges (voice and flute), only to disintegrate again through a saxophone improvisation. The second slow section is divided by substantial pauses before isolated tutti utterances (including percussive sounds such as the flute’s tongue pizzicato), more or less in rhythmic unison, reinforce the protagonist’s halting perplexity. When the music again gathers momentum, the trumpet and double-bass track the voice until the most active heterophony takes hold (overt use of ostinati, another favoured Zubel device). It is as if the soloist is trapped, thwarted by identical routes which lead nowhere. At this point, the instruments take over, developing what is in effect a group improvisation. At its climax, the voice exclaims “There must be an exit somewhere”, only then coming to a moment of illumination, of self-realisation, upon which she and the instrumental ensemble gradually fade in the half-light. Aphorisms on Miłosz was commissioned by the 2011 ‘Sacrum Profanum’ festival in Kraków as part of the project Made in Poland – Miłosz Sounds. It was premiered during the festival, on 15 September, by the composer and Klangforum Wien under Clement Power. Zubel selected seven brief observations from Miłosz’s writings dating from 1982 to 2006. She has an ear for quality verse: Miłosz, too, won the Nobel prize for literature (1980) and she had set his work previously, in A Song about the End of the World (1998) for voice, reciter and instrumental ensemble. The instrumental line-up for Aphorisms on Miłosz is flute, clarinet/bass clarinet, trumpet, accordion, percussion (marimba, crotales, tam-tam, suspended cymbal, three triangles, wood block and timpani), and string quintet. Zubel was inspired by Miłosz’s words ‘This is this, that, the other thing, All just as it is’, but it took her some time to find the right texts. Frustrated that her initial search for a single poem had not unearthed anything suitable, she suddenly realized that she had marked up a rich collection of single sentences, both prose and verse. She whittled her selection down to just seven aphoristic fragments that charted a subtle narrative from human strength to human doubt, which she identified as a central thread in Miłosz’s own output. While many removes from the overt narrative of song cycles by Schubert or Schumann, Zubel’s Aphorisms on Miłosz nevertheless belongs to that genre, bringing to life the poet’s brief phrases in an extraordinarily vivid and varied manner. The quasi-electronic introduction gives way in the first aphorism ‘Spojrzenie’ (Look) to instrumental cascades whose intervals gradually stretch from the initial semitones to perfect fifths. The voice rides serenely over this plangent texture before the introductory idea returns. The second aphorism, ‘Biegacz’ (The Runner), presents a complete contrast: a highly rhythmic tutti, hocketing with the voice, in an evocation of an exaggerated athletic action. There is something both manic and comic in this, not least when Zubel takes the syllables of the second phrase and presents them initially in reverse order – gi-no-ne-wa-mo-for-u-brze-do-miał-bo – before eventually fixating on the main word ‘nogi’ (legs). The music grinds to a muscle-bound halt. The third aphorism ‘Boleść’ (Pain), with its grimacing string tension, percussive vocal sounds, and vocal and instrumental glissandos, is reminiscent of Polish music written 50 years earlier (such as Górecki’s Genesis cycle). It is leavened somewhat by the wistful trumpet obbligato at the end. A long-breathed interlude leads to the intermittent and somewhat ghostly vocal-instrumental patter of ‘Otchłan’ (Abyss), with its backdrop of shimmering harmonics. Blink, and the listener might well miss the fifth aphorism, ‘Płomień’ (Flame), as it flickers and is gone in a couple of seconds. It is followed by over half a minute of the soft brushing sound from the percussion that introduced it. Once again, Zubel’s uncanny ability to juxtapose highly contrasted textures within an overall expressive arch is demonstrated in the sixth aphorism, ‘Podszewka’ (Lining). This somewhat bizarre idea – ‘When I die, I will see the lining of the world.’ (and the doubt that then sets in) – inspired Zubel to create a laid-back, jazz-inflected number, dominated by accordion and double-bass, word repetitions and ostinati. The final aphorism, which picks up on the word ‘Jeżeli’ (What if) from its predecessor, dwells on doubt – ‘What if all this is but a dream’. The overlapping, stretched notes suggest existential disorientation and bring Zubel’s exquisite sequence to an enigmatic close. Shades of Ice, the one work on this disc that is purely instrumental, is scored for amplified clarinet, cello and live electronics. It was commissioned by the London Sinfonietta and premiered by Mark van de Wiel and Tim Gill at Kings Place, London, on 20 October 2011 as part of the ensemble’s ‘Sonic Exploration’ series. Shades of Ice was inspired by the Icelandic glacier Vatnajökull, which Zubel has explored on her several visits to the country. She became fascinated not only with the variety of colours – whites, blues, greys, blacks – but also with the sound and atmosphere of Vatnajökull. Yet she was not intent on writing a programmatic or illustrative piece, using the glacier rather as a reference point. Remarkably, she chose a small ensemble rather than a large orchestral palette, yet the ‘canvas’ of her imagination is unbounded. She brings together many of her characteristic textures and techniques – multiphonics, heavy bow pressure, rhythmic vitality– and combines these with an electronic element based on her own field recordings in Iceland. The resultant soundscape is monumental. Since 2010, Zubel has developed a remarkably rich relationship with Klangforum Wien, having already given nine concerts with the ensemble. 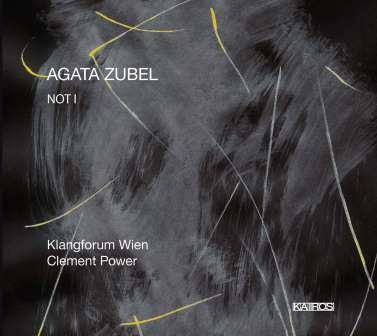 It was with them that she gave the premiere of Not I, on 13 September at the 2012 ‘Sacrum Profanum’ festival in Krakow, and it is this award-winning performance that is included on this CD. Not I marks another return to one of Zubel’s favourite authors: Samuel Beckett, who like Miłosz and Szymborska after him, won the Nobel prize for Literature (1969). She had already set a text by Beckett in Cascando for voice, flute, clarinet, violin and cello (2007) and turned to him again for What is the word for voice, flute, violin, cello and piano (2012). Not I is a setting of excerpts from Beckett’s famous monologue of the same title, written for a solo female performer who is invisible except for her lips and mouth. At the premiere, Zubel added a large-screen pre-recorded video showing just her mouth, while she performed live among the instrumental ensemble which she has added to Beckett’s monologic text. The instrumentation includes multiple flutes (one performer), clarinet/bass clarinet, violin, cello, piano, a wide range of percussion and electronics. One might legitimately ask the question: ‘Why set a text that is so evidently self-sufficient?’. Beckett, of all playwrights, eschews action, focuses on the word, on the solo performer (or occasionally more). Yet Zubel, for whom words are a magnet and who delves deep into her chosen texts before actual composition takes place, feels a special chemistry with Beckett. She had seen Not I in the theatre many years ago and was captivated by its implicit drama, by its searching expressivity, by its all-too-human dimension, and by its technical aspects: the ‘…’ between phrases, the short and the long repetitions, the circularity of the vocabulary. All these features chimed in with her own musical and expressive world. There was the added dimension that she could write it for herself to perform, thus uniting her vocal and compositional aspirations and activities. The result is a tour-de-force, virtuosic and compelling, with the purely audio version wanting for nothing. Zubel’s Not I follows Beckett’s own sections, which in the screenplay are separated by pauses and gestures of ‘helpless compassion’ from a silent onlooker (this element is reinvented by Zubel). The scenario, such as it is, concerns a 70-year-old woman recalling incidents in her life piecemeal. She has not spoken for decades. As someone who is totally aware of her voice in concert and in everyday life, Zubel was fascinated by what this sensation might be, of hearing one’s own voice when the vocal cords had been out of use for such a long time. Accordingly, she dissects Beckett’s opening monologue into constituent vowels and consonants, adding further repetitions. This percussive texture, joined by unpitched percussion, poignantly flowers into quasi-pitch oscillations on “so no love”, only to fall back to speech patterns. These develop a rhythmic interplay with the ensemble before breaking off at the first pause (entry of piano with a sort of out-of-body vocalise standing in for Beckett’s silent onlooker). In section two, the voice sings in unison with the piano, as other instruments play heterophonic descending scales or flurries of demisemiquavers. The occasional laugh and exclamation cut in, but this is essentially a breathless scherzo of astonishing energy, furious and twisted, coursing hither and thither. It is a huge challenge to singer and instrumentalists alike. The woman’s ‘scream’ provokes a substantial and increasingly intense reflection, accompanied by strummed cello (played in guitar position). The second pause, like the first, is a vocalise, this time accompanied not only by piano but also by the crotales which had crept in at the end of the preceding passage. Zubel also adds a new element, a tape on which she has recorded herself reading those parts of Beckett’s script that she cut out of the live performance. In this ingenious way, she not only incorporates the entire text but creates a new layer of meaning to the monologue. Section three emerges seamlessly, the voice developing a new virtuosity of interlocking vocal idioms, threatening at times to be overwhelmed by these other voices. The madness culminates in the live voice dropping out altogether as the instrumental ensemble reiterates (with minor variations) a fff punctuated falling figure. This passage comes at the moment of Beckett’s third pause, and its abrupt end (with that of the tape) leads directly into Section 4, ‘something she had to- … what?…’. At this point, Zubel returns to earlier ideas (commensurate with Beckett’s text), the violence of the interchanges shocking in its immediacy. The final pause (cello and vibraphone) introduces gently the protagonist’s return to inarticulacy, with the other voices returning, looped in their own ostinati like a piece of post-war musique concrète. As before, the tape overwhelms the live soloist, who is replaced by cadenzas for unpitched percussion and strummed cello as if to underline her return to the silence from which she had, for this brief moment in her life, broken out.